Obtain a long luxurious mane without breaking the bank! Our EZ Bundle hair is made with premium synthetic fibers that have gone through nutritional fortification to allow for a Remy-like feel. This hair is extremely versatile. 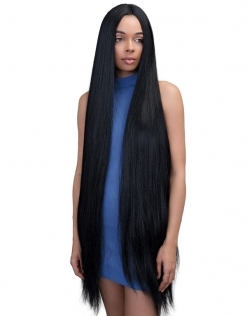 You can create long ponytails, clip-ins, or even install a sew-in weave. The styling possibilities are endless! This hair is heat safe, so feel free to curl or flatiron this hair up to 360 degrees Fahrenheit and 180 degrees Celsius.